A preview of yarn to come on Wednesday (or Thursday is the not-feeling-well continues tomorrow as well and I don’t get more work-stuff done). 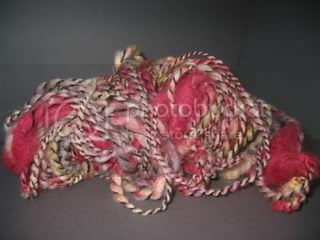 I’ve been trying to spin some more artsy yarns lately instead of my usual- and I hate to say it, favorite, smooth 2 and 3 ply handspun. I’ve been continuing to work on my colorwork piece, but I am not sure if I am thrilled with how I chose to arrange the colors and if it will be too “stripey”. 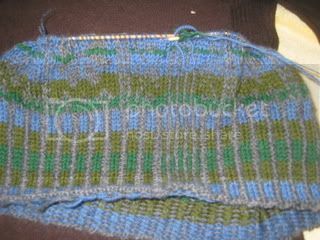 A couple repeats will tell I suppose- if I don’t like it I plan to felt it in to a cat bed after some decreasing. This piece is unique in that I am doing it at a slightly looser gauge that one would usually use for colorwork as I plan to full (not felt, full) the piece slightly, after doing a test swatch of course. It is also unusual in that I did some simple waist shaping- it only draws in maybe 1.5-2 inches, but should be enough to make it not seem baggy like many colorwork pieces are. You might have noticed that I keep calling this colorwork instead of fair isle. The patterns, but not the arrangement or style(and certainly not the color arrangement! ), are indeed Fair Isle, but Fair Isle refers to a specific style/type of design of which mine is not. Colorwork, two stranded, stranded knitting, and many others are terms which would more accurately represent what I am knitting. 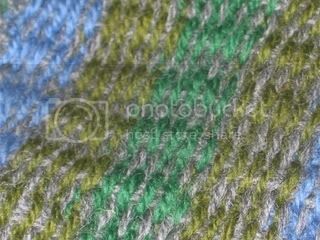 There are many colorwork books out there that discuss the differences between a Shetland, Fair Isle, Bohus, and colorwork sweaters based on differences in regional styles.